Next to the Macy’s One Day Sale, the Macy’s Friends & Family Sale is one of the best times to save money at Macys.com. But during this Friends & Family Sale, there is one thing you NEED to know that makes it different from all other sales: you can save 15% off your beauty purchase! Since I know you’re already a seasoned Macy’s shopper, it should come as no surprise when I tell you that beauty rarely goes on sale. So to be able to maximize your shopping during the December Friends & Family Sale, here’s what you need to know: the biggest insider scoop you’ll want to pay attention to is this: save 15% off when you shop Beauty. Save an EXTRA 30% OFF: select regular, sale & clearance clothing, shoes, accessories, jewelry & home items, with exclusions listed. Save an EXTRA 25% OFF: select regular, sale & clearance watches, with exclusions listed. Save an EXTRA 15% OFF: select regular, sale & clearance cosmetics/fragrances, with exclusions listed. Save an EXTRA 10% OFF: select regular, sale & clearance furniture/mattresses/rugs, lighting & small appliances, with exclusions listed. Not only can you save on the designers that RARELY go on sale right now, but you can also get some of the BIGGEST savings all year. Whatever you do, don’t wait long to start shopping. 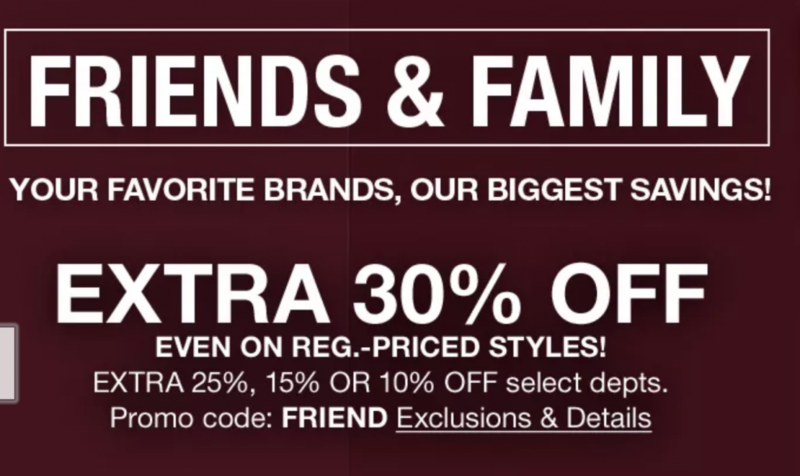 The Macy’s Friends & Family Sale ends on December 8, 2018.